While the rice is cooking, heat the oil in a pan over medium heat, and sauté the onion and garlic for 3 minutes. Add the artichokes and sauté for another minute. Season with salt and pepper, add the half and half, cheese, raisins, and pecans, and stir well. Turn off the heat. When the rice is ready, make one layer of rice (about 1/4 cup) on the bottom of a small cup. Press down with a spoon. Cover with a layer of artichoke stuffing. Press down with a spoon. Finish with another layer of rice. Cover the cup with a plate and turn the cup upside down. Lift the cup carefully. Repeat with the remaining rice and stuffing. Sprinkle each arroz tapado with chopped parsley. You can use leftover rice to make this dish. All you have to do is heat it up before serving. If you want to make this recipe vegan, use coconut milk instead of half and half, and skip the cheese. Arroz tapado is a very traditional, simple, and satisfying dish from Peru. It’s prepared by forming two layers of rice, with a layer of ground beef, raisins, black olives, and hard-boiled eggs in-between (this is the same stuffing used to make papas rellenas). The layering can easily be done inside a cup, which is then turned upside down over a plate and lifted. What you are left with is a very attractive rice-and-meat terrine that takes very little time and effort to make. Throughout my life, I’ve had arroz tapado plenty of times using vegetarian-minced meat or chopped mushrooms in place of ground beef. 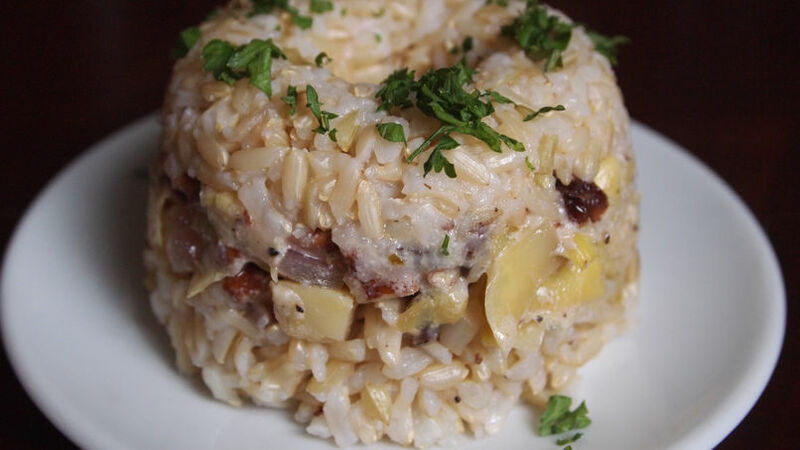 But it wasn’t until a few weeks ago when a chef friend of mine posted some pictures of her artichoke version of arroz tapado on social media that I realized I could get a lot more creative with this dish. Here you have my own artichoke version of this staple meal inspired by my friend’s recipe, and I have to tell you I absolutely loved it. This was the first, but will certainly not be the last, time I make it this way.